Happy Monday Wyrdos! Today we have a special Monday Preview of our upcoming game Bayou Bash. We are starting by showing off the Pig Rider! Bayou Bash is an upcoming racing game filled with speed, out of control animals, and good old fashioned fighting. Become a jockey in the most dangerous race this side of the Breach, doing everything you can to wow spectators and fans as you barrel toward the finish line. 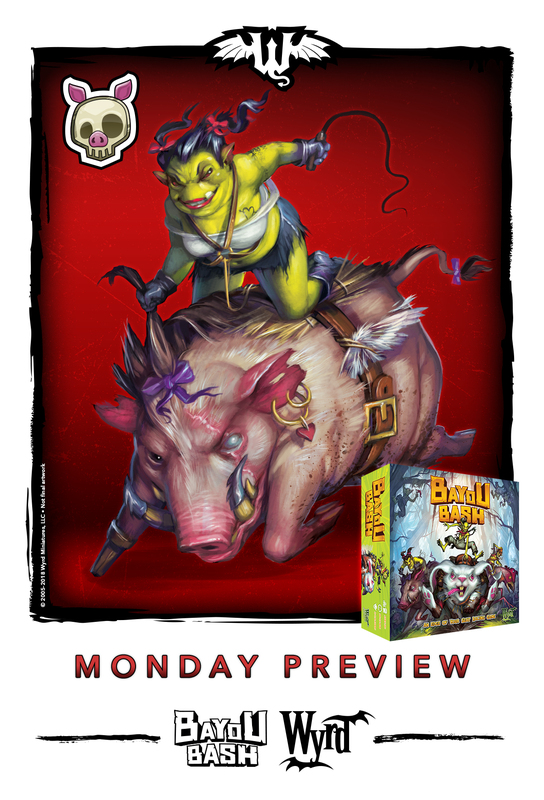 With an assortment of wild animals and slightly unhinged Gremlins, Bayou Bash encourages players to cut loose and move as fast as they can, only slowing down to try to send their fellow racers careening off the track. Speaking of mounts, the Pig is one of the meanest in the swamp. She is an aggressive powerhouse in the race. While some racers excel at speed or stability, the Pig uses her tusks to toss around the competition. Don’t let her pretty bow fool you! 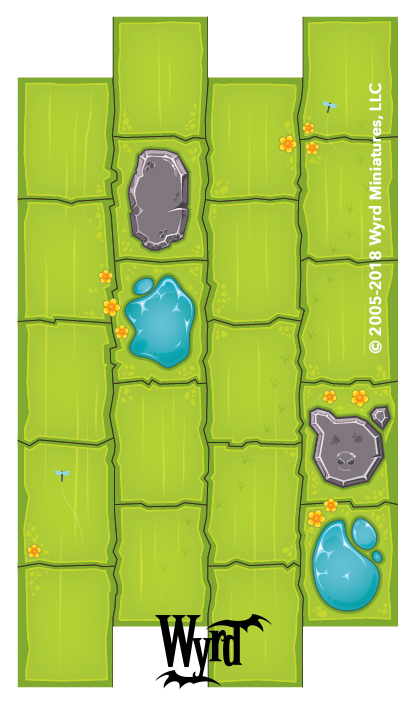 The Pig isn’t afraid to take a dip in the mud in order to push her opponents around. Be sure to check out Bayou Bash, coming later this year! *yaaaaaawn* That model looks like such a... boar. We've been bacon it for a long time in the game design office, and I think it's more than just swine... I think it's great! Will be models from this game playable at Malifaux as alt models? What will the sizes of the models in Bayou Bash game be, will they be the same size as Malifaux models? Your proxy rules are up to your local community. I mean will be they count as official alt model for Malifaux and be allowed for tournaments? Well, the only thing that defines official proxies are the Gaining Grounds document, and they're not in 2018. That would mean that they could show up in 2019, but I don't want to make any promises at this stage. That said, as usual, TOs can allow in what they please. Some of these are obvious proxies, so shouldn't cause a headache. Nice to see this game whipping into shape! I think the first Malifaux tournament I attended had people using the Puppet Wars figures as alt versions of the Malifaux models. And there's nothing concerning that in Gaining Grounds. A puppet Lady Justice is still Lady Justice - just another alt sculpt! I still have full Malifaux crews for Lady J and Seamus - must dust them off and use them again as they look great! Fascinating collection of alternate sculpts that don't come on the correct base sizes to be used in a Malifaux. Yeah, I own both the plastic and metal Puppet Wars figures (not that I ever expect to see a Puppet Lucius...); and I've used Puppet Wars figures to play Malifaux. But they are in no way Malifaux "alternate sculpts". They're models for a different game by the same company that happen to work perfectly. Anyway, the point I was trying to make in the previous post, that I think I left off, was that if the figures end up being anywhere close to the right sizes, they're going to get used. I wish more and more information about Bayou Bash will be coming on next few Mondays! Can't wait to get this game! One question, being a racing game how many tracks are included in the box? I'm thinking something like "Formula D" meets the Bayou and becomes epic. It's actually a bunch of track pieces that you can arrange in different ways, so there are a lot of potential tracks. We had an example piece at PAX Unplugged. Surely someone snapped a photo. I haven’t seen a single photo from PAX Unplugged, but then I follow Wyrd-focused info streams and not general gaming. You have to be your own hype machine here! Great, thanks! With the hype in my community, if we join all the pieces we could built the Daytona circuit 1:1.